We need a bass player who can preferably sing. 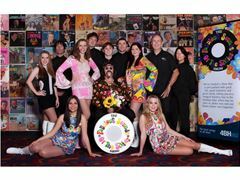 We do three different shows - the most popular one is "The Fabulous Sounds Of The Sixties Show". It's an 10 person show plus production. We mainly play venues such as RSLs and leagues clubs. The show is doing well, having picked up the award for Best Production Show for three years in a row at the Samsung Entertainer Of The Year Awards for Clubs in Sth Qld. The show was proudly supported by 4BH-882 (now known as Magic 882) for nearly four years and we are now seeking another sponsor. The same group do an alternate show comprising of '50s, '60s, '70s material plus originals and contemporary material. Some of the material is the same as the Fab Sixties Show. The nucleus of this act is my own five-piece band which performs independently of the show as well. Again, a lot of the material is the same as before. We also do originals. The bass player is an integral member of all shows. We are looking for an excellent player who can replicate the sounds of the original records. Image is also a crucial part of the Sixties Show. A well-presented, educated guy under 40 is preferred. The image of that show is young people doing music from 40 years ago (the average age of the group is 23). We would prefer someone with a full head of hair! This show will not suit someone who is too involved with a day job or family commitments.